Adding Magento CMS Blocks to Your Page | Beckin - Certified Magento & Salesforce Commerce Cloud Developer. Adding custom Magento CMS Static Blocks to your Magento files is very easy. 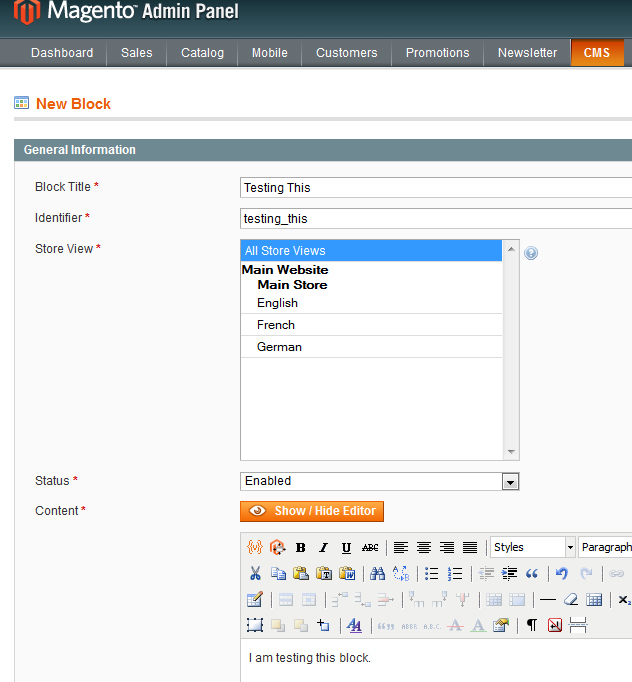 First navigate to CMS->Static Blocks in your Magento Admin area. Next you will want to click on the Add New Block button. Next lets give it a Block Title. This can be anything you want. The Block Title helps you to identity what the static block contains. Next let’s move on to the Block Identifier. The block identifier is slightly different. This is how we will call the block in our template files. The general rule for the block identifier is using under scores for the spaces and should resemble the Block Title. For example, if our block title is called “Testing This” our Block Identifier would be “testing_this” without the quotes of course. Next you can select your Store View and set the Status to enabled. Finally enter your static block content and click the save block template. Finally we will want to add our newly created static block to one of our template files. In this case, we will add our new static block on the product page directly below the product name. To do this we need to edit the view.phtml file found here. app/design/frontend/default/YourTemplateTheme/template/catalog/product/view.phtml. Here we will add our static block below the product name by add this to our template file. The above code will call our static block. Did you notice the block identifier we created earlier in the round brackets? Finally just save the file and presto, you static block now shows up on the product page!